Dr Perlmutter’s comment during my interview with him, regarding our hunter gatherer ancestors being inherently ‘lazy’ makes a lot of sense, because; why would you expend any more energy than you absolutely had to, if food was scarce most of the time? He is also hinting at a probability of the human body being quite well adapted over millions of years to function just fine and stay lean on minimal amounts of physical activity. In other words, staying lean and losing body fat looks as though it might be controlled by factors other than just being physically active. Interviewing Dr David Perlmutter in April 2016, two and a half years after our first meeting, was very educational and on a more personal level, tremendously insightful to hear his take on the change my own physique seems to be going through since I stopped long distance running. 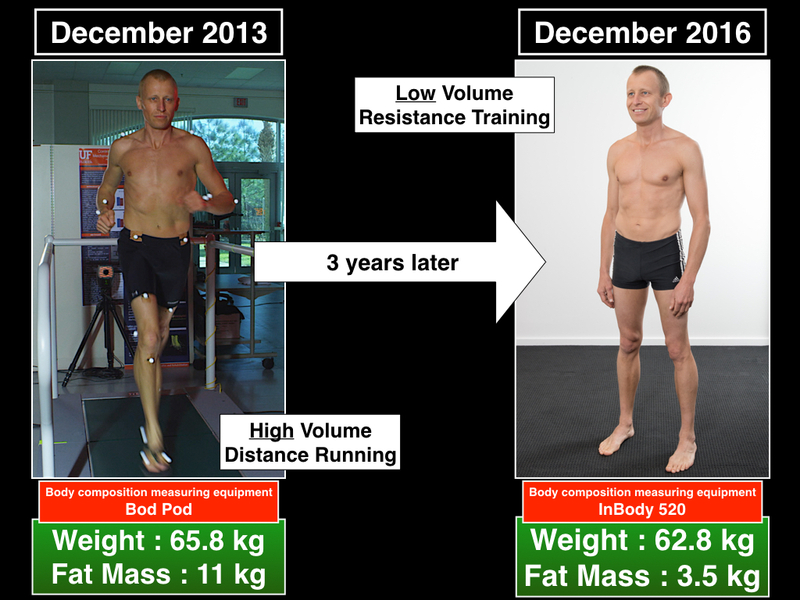 Why would my body retain body fat on a high volume distance running schedule while shedding body fat on a more sporatic low volume resistance training program? The majority of my self experimentation has been focused on isolating the exact role of food (diet) and activity (exercise) in regards to the change in my body composition since late 2013. By attempting to accurately quantify my techniques, methods and results, it is my hope that you the reader, will be able to implement the same principles to maintain or better your own body composition, I hope you enjoy and find some value in my blog post…. Shortly before interviewing Dr David Perlmutter in 2013 at his home in Florida, I spent time at the University Of Florida (UF) in Gainsville for some extensive performance testing. At the time, I was on a quest to equal and hopefully break my grandfather’s personal best time for the marathon distance of 42.2 kilometers, which in 1952 had qualified him to compete in the Olympics. 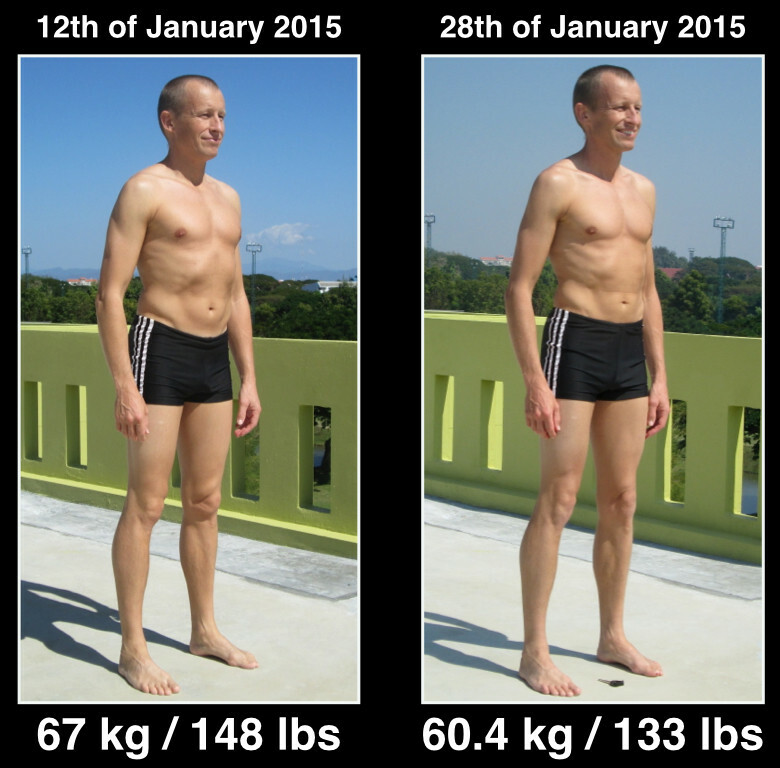 Six months prior to being tested at the University of Florida in 2013, I had started to implement a diet regime containing less carbohydrate and more fat, known as Low Carb High Fat (LCHF) and/or the Ketogenic Diet  . One of the first books I ever read on the subject of reducing sugar and carbohydrates in my diet was Dr Perlmutter’s book Grain Brain. A low-carb diet restricts sugary foods, and starches like pasta or bread. Instead you’ll eat delicious real foods, including protein, natural fats and vegetables. Today, I am thoroughly convinced that my above average test results at UF in 2013 was more a direct result of my genetic make up combined with the correct nutrition for my physiology and possibly in SPITE of (not BECAUSE of) running a bucket load of kilometers every week? Three years after abandoning the quest to equal my grandfather’s best marathon time and more or less stopping running all together – the results are in. In my mind, there is evidence to support the suspicion I have in regards to high volume long distance running being somewhat detrimental to my body, may be correct. By evidence, I am referring to my leaner body composition these days, compared to when I was running more than 100 kilometres per week, back in 2013 – 2014. However, my data collected over time, becomes a bit more fickle from which to draw an accurate conclusion, simply because I have used multiple methods to asses my body composition. While the metrics regarding my fat free mass and fat mass in the above image are factual, when it comes to comparing two different body composition measuring methods, it may in fact be like comparing apples and oranges! The Bod Pod, Dexa Scan and InBody are all claimed by their individual manufactures to be accurate methods of estimating & monitoring changes in body composition. As you can see in the image above, on the 25th of July 2016 I did a direct comparison between a Dexa Scan and the InBody 520. Even though InBody advertises 98% accuracy to Dexa, it did not seem to hold true in my personal experiment on this particular day. 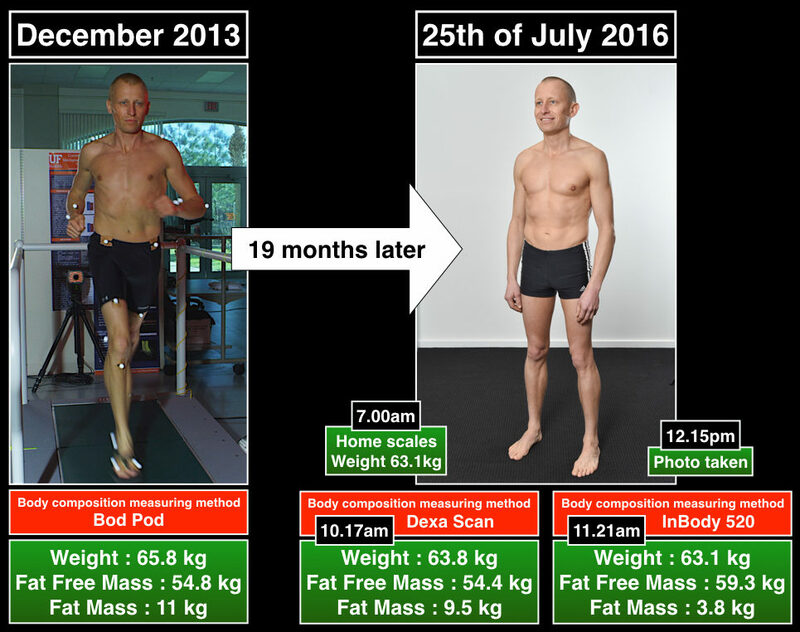 Comparing my December 2013 Bod Pod results to my 25th of July 2016 Dexa Scan, it seems possible, that my fat mass could have been reduced by 1.5kg, especially if my similar physical appearance is also taken into account. According to these two studies   there is good correlation between the Bod Pod and Dexa Scan. 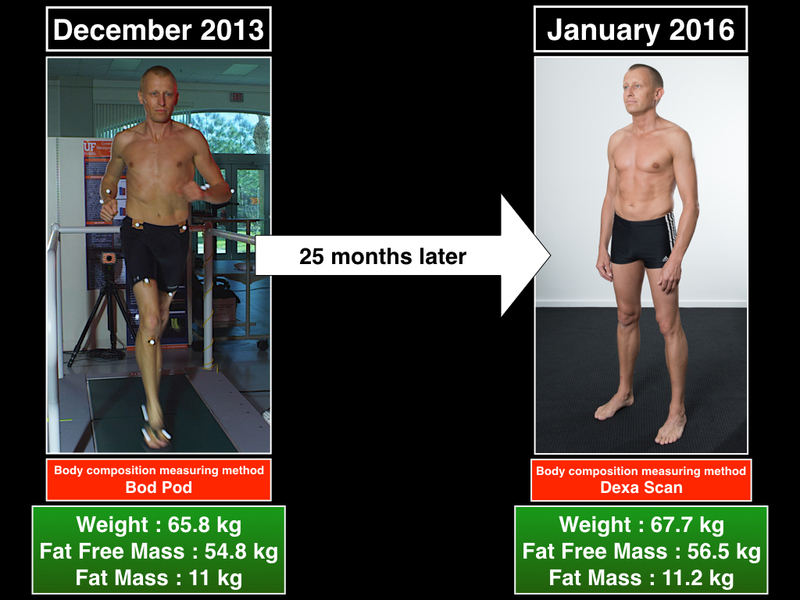 Comparing my December 2013 Bod Pod results to my 25th of July 2016 InBody 520, it seems impossible, that my fat mass could have been reduced by 7.2 kg, especially if my similar physical appearance is also taken into account. I have not found any studies comparing Bod Pod to InBody. Apparently, all three methods are also very susceptible to water and food intake immediately prior to testing. In December 2013 I remember having breakfast a few hours before the Bod Pod test, whereas on the 25th of July 2016 my Dexa Scan and InBody testing was done fasted with no fluid of any kind three hours prior. All three methods may very well be correct – if compared only to themselves [Bod Pod to Bod Pod] [Dexa to Dexa] [InBody to InBody] and under similar circumstances, at least this is my personal experience with using them. Suffice to say, measuring body composition may not be as straight forward as it first seems. 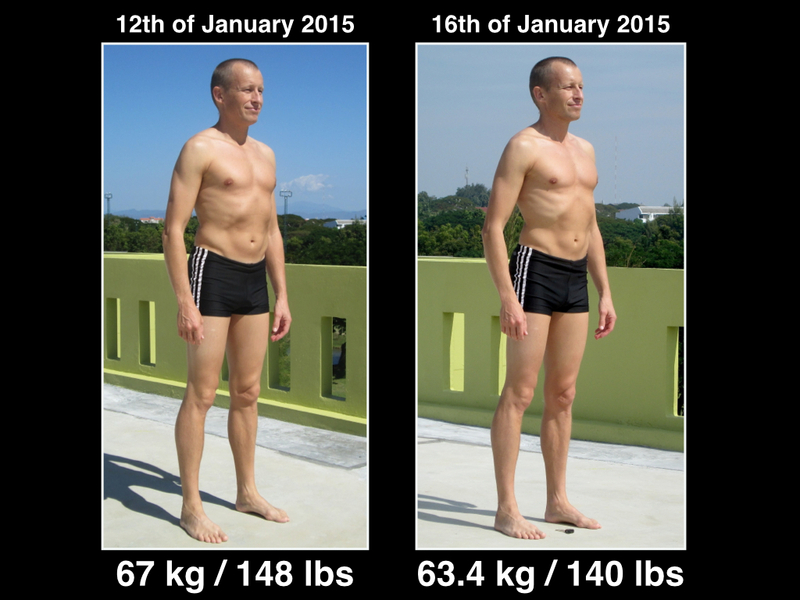 Later in this post, I will expand on my 2016 body composition test results, hopefully without confusing you 🙂 and try to make a compelling argument for why I do believe my fat mass has in fact been reduced significantly since 2013. Excessive exercise = Insulin Resistance ? The possibility of my (former) ultimate passion (distance running) doing me harm, first occurred to me while reading The Art and Science of Low Carbohydrate Performance. In this book, a study known as the Postmarathon Paradox is mentioned, indicating an impairment of the body’s response to Insulin (aka Insulin Resistance) on the morning after completing a marathon, since I was training for a marathon, this of course sparked my interest. Insulin is the major hormone within our body, which facilitates the absorption of blood sugar into muscle and organ cells for energy production, growth and repair. Insulin also assists the absorption of any excess blood sugar into fat cells, where it is converted to fat and stored as an energy source. …our fat cells tends to remain insulin sensitive, causing blood sugar to primarily be converted into body fat and we now gain weight from OVERFED & growing fat cells, while at the very same time STARVING & shrinking our muscles and organs. In my mind, this scenario makes sense as to why obese people are always hungry and supposedly eating too much. The fact is they are starving on the inside while growing outwardly larger. In 2013, I was seemingly no where near being classified as obese according to the above medical definition of the word. Nevertheless, after reading about the postmarathon paradox, I speculated that I may already be well down the track of insulin resistance due to the constant physical stress from my high volume distance running schedule. I have since learnt, that being insulin resistant and remaining OUTWARDLY LEAN while becoming INWARDLY FAT, known as a TOFI (Thin Outside Fat Inside) is also entirely possible. Michael Moseley, author of the the 5:2 fast diet and more recently the 8 week blood sugar diet, has helped bring attention to the fact of relatively slim looking individuals, (myself included) may in fact not be as lean and ‘healthy’ as they first appear to be. Nearly four years ago, I was diagnosed as a type 2 diabetic. I was not particularly overweight, weighing about 189lbs (86kgs) and I didn’t look particularly fat, but that was because a lot of the fat I was carrying was internal. I was a TOFI, Thin on the Outside, Fat Inside. I went for a special MRI scan and as you can see from my picture, I had lots of fat (the white stuff) clogging up my internal organs. Today, with the advantage of more than three years hindsight and educating myself more on this particular subject, I am now thoroughly convinced that the major reason I have a leaner physique today with less body fat and possibly more muscle mass, is because I returned to Normal Function. 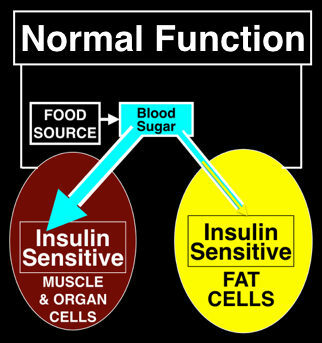 Restoring my Normal Function, meant that I once again became equally Insulin sensitive in all cells, allowing the energy I was deriving from food, to primarily be absorbed into muscles and organs while simultaneously limiting my body fat accumulation. Eventually, this return to normal function also lead (in my opinion) to the release of excessively stored body fat – causing a further fat loss. In this public presentation from May 2016, I give my interpretation concerning the role Insulin performs in body fat regulation. * Which of course now needs to be taken with a grain of salt since my further analysis thereof. While working on this blog post, I chose to undergo a two hour Glucose Tolerance Test including Insulin measurement (GTT/INSULIN). 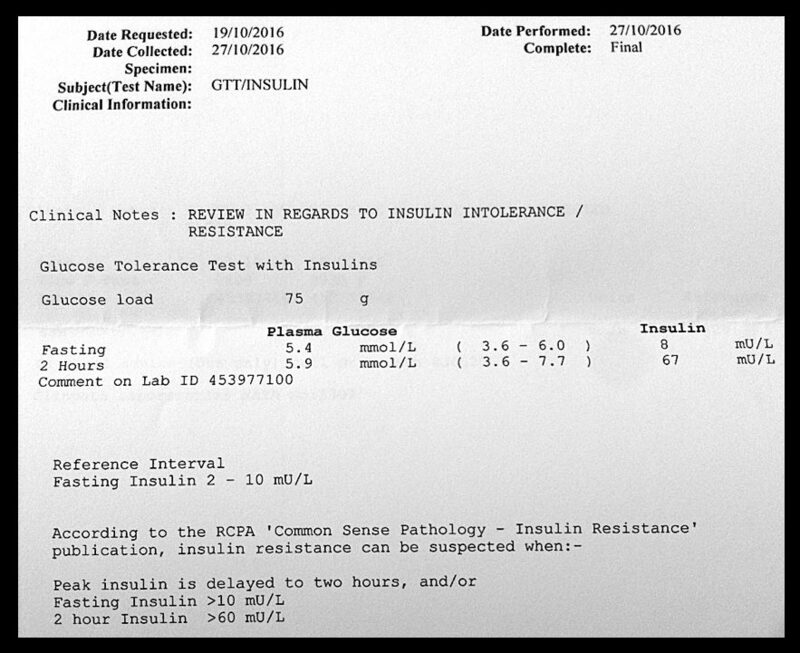 The more I learn about the topic of insulin resistance, the more it seems likely that my body may still be affected by it. Looking at my test results, I was within normal ranges for both fasting Plasma (blood) Glucose : 5.4 (Range : 3.6 – 6.0) and Insulin : 8 (Range : 2-10). 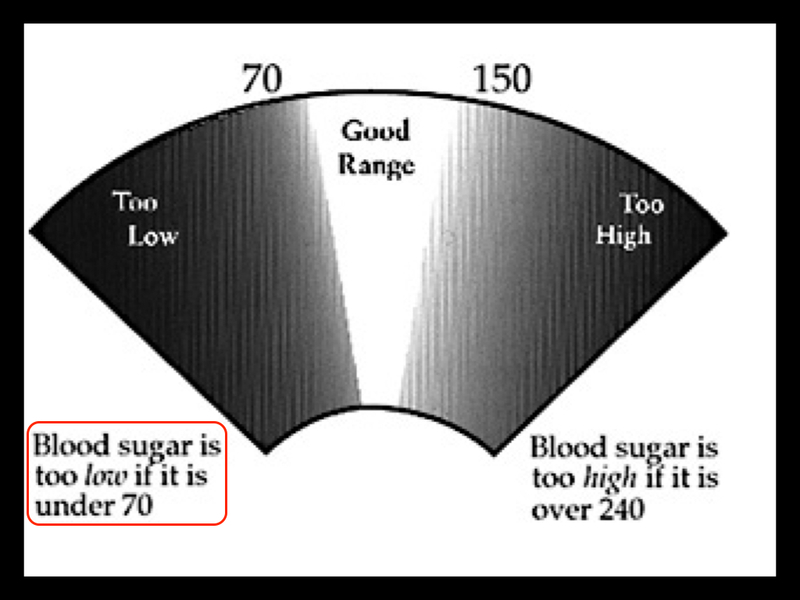 According to a Common Sense Pathology (CSP) publication on insulin resistance (IR), it can be suspected if the two hour insulin is greater than 60. Mine was 67 !!! In it’s Pdf, CSP recommends the HOMA and QUICKI index, to further asses one’s likelihood of IR. 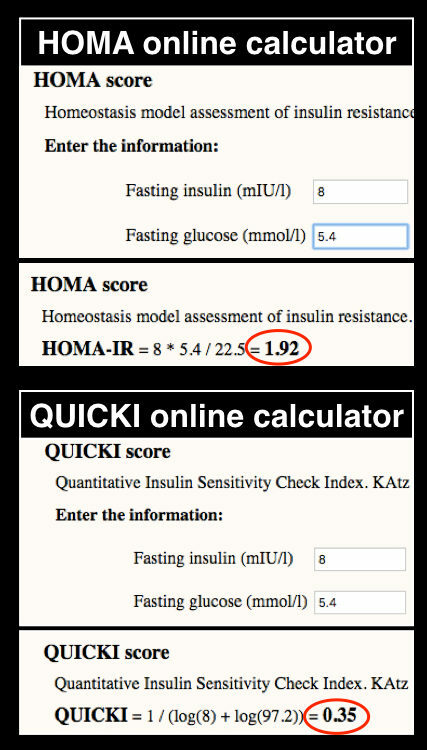 Plugging in my own numbers to the HOMA online calculator and the QUICKI online calculator I was able to obtain my results. HOMA estimates everything is normal if your number is below 2. Mine was 1.92 – borderline insulin resistance. QUICKI determines everything to be normal if your number is above 0.55. Mine was 0.35 – severe insulin resistance. Note the inverse relationship with the degree of resistance. Sparking my curiosity further into this topic, was a blog post published on the 21st of December 2016, by Jason Fung. In his article, Jason Fung talks about Joseph Kraft, a medical doctor who supervised more than 14.000 glucose including insulin tolerance tests (GTT/INSULIN), done over a five hour time period versus the standard two hours as I underwent myself. Roughly plotting my insulin (67) onto Joseph Kraft’s graph and correlating with his literature – I come in at borderline diabetic! Needless to say, proposing that I may have been (or still am) a TOFI and possibly a borderline Type 2 Diabetic is ofcourse very much speculation. I have not yet undergone a five hour glucose tolerance test to properly asses my insulin resistance, nor have I had an MRI like Michael Moseley to determine if there is excess fat sorrounding my organs. Nevertheless, it does start to look like, my anticipation three years ago, that I could well be on a very destructive path regarding the future functioning of my body (by running excessively and consuming too much carbohydrate), could in fact have been a pretty good guess? 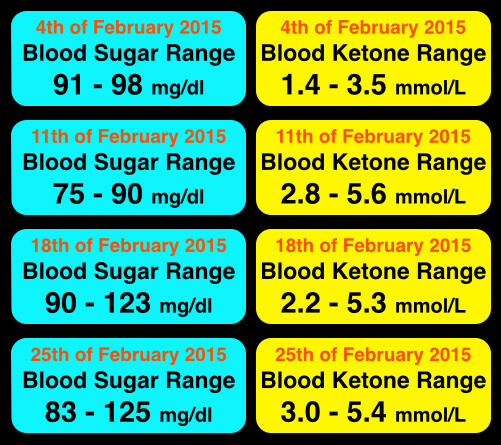 If you simply wait until blood glucose is elevated, then you have T2D, no question. But if you have normal blood sugars, then you may still be at risk of diabetes (pre-diabetes). Excessive exercise = Degrading muscle ? Dr Perlmutter also pointed out another paradox; even though I was fit by every measure in 2013, I may also have been breaking down my own muscle tissue into glucose/blood sugar, through a normal bodily process known as Gluconeogenesis (new formation of glucose) in the exact same time period. 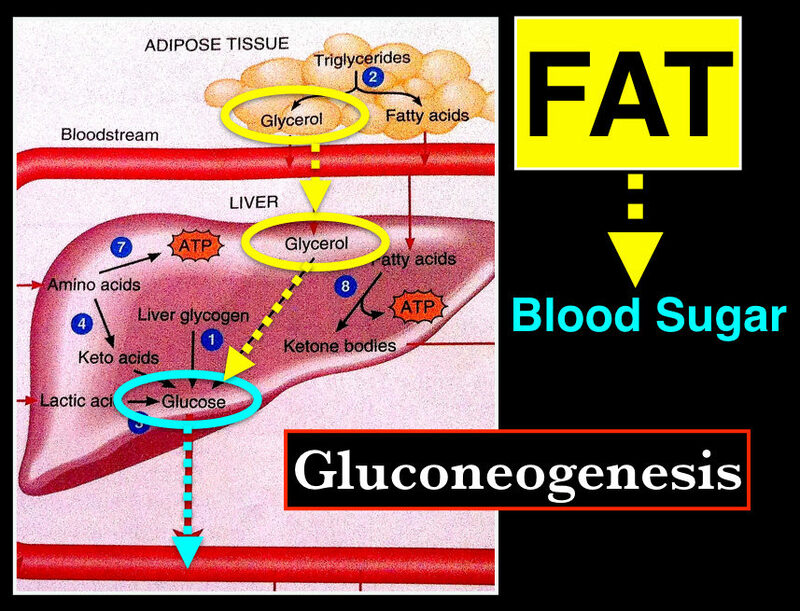 Since I was such an extraordinary fat burner and Gluconeogenesis incorporates the ability to make glucose from adipose tissue (body fat) as well as muscle tissue, there had to be a plausible explanation as to why my body would choose to retain a fair amount of body fat and preferably break down muscle tissue? While this (still hypothetical) ‘degrading muscle scenario’‘ was undoubtedly related to the previously discussed insulin resistance as well as my body trying to make more blood sugar to fuel my running, there seemed to be more elements in play for it all to make proper sense. Because I was bombarding myself with an activity which requires lightness to be efficient, it seemed obvious that my body would want to get rid of as much excess weight as possible and shedding body fat rather than muscle tissue seems logical – so why did the opposite appear to have taken place? Maybe it was time to investigate – exactly how exercise was impacting my body? Exercise : A specific activity that stimulates a positive physiological adaptation that serves to enhance fitness and health and does not undermine the latter in the process of enhancing the former. More clues started to emerge when I discovered this video with Dr Doug McGuff and later on his book Body By Science. Doug McGuff explains at length, how the impact of exercise influences the human body and being exposed to his knowledge has completely revolutionized what limited wisdom I personally believed to posses on this topic. In my anatomy book, it talks about what physiological changes may take place by prolonged exposure to high levels of stress hormones like cortisol and refers to this state as exhaustion. Having deduced this hypothesis in a roundabout way from self education and experimentation as to why I am leaner with more muscle in my forties than I probably ever was in my twenties and thirties, makes me appreciate how freely, the likes of Dr Perlmutter and Dr McGuff share their knowledge through social media channels and publishing of books. Had it not been for access to this kind information, I would most likely still be pounding the pavement in a state of exhaustion, which in itself, is a pretty scary thought! Below is a snapshot of what my training schedule looked like, just before I decided to stop running, which I am now almost convinced – was keeping my body in a state of permanent exhaustion. In this short video recorded during the training week shown below, demonstrates my understanding in relation to the use of body fat for energy, but also my total incomprehension about the possibility of a ‘degrading muscle scenario’‘ being in play. Because I remained virtually the same body weight with a bucket load less formal physical activity over the next two years following my ‘retirement’ from running, I was starting to contemplate that exercise was largely irrelevant concerning the maintenance of a lean composition, it seemed more likely, that choosing my parents well (my genetic makeup) combined with what I ate, was mostly determining my degree of leanness. The above paragraph was starting to become my conclusion….up until I decided to explore the possibilities and effects of High Intensity Training (HIT) as outlined by Doug McGuff and others like Drew Baye and Skyler Tanner. Extracts from What is HIT? Deciding to investigate how HIT would modify my body composition, I went to a local Dexa Scan facility, (Bod Pod was not available) in order to establish a baseline for my body composition at the onset of commencing a regular HIT routine. This particular Dexa Scan result (January 2016) also gave me some insight into how my physique had changed over the past two years, since ‘retiring’ from distance running in early 2014. As earlier mentioned, in trying to decipher how well the Bod Pod and Dexa Scan compare, I had found two   studies – both concluding that a Bod Pod shows approximately two percent higher body fat than a Dexa Scan in the same individual. 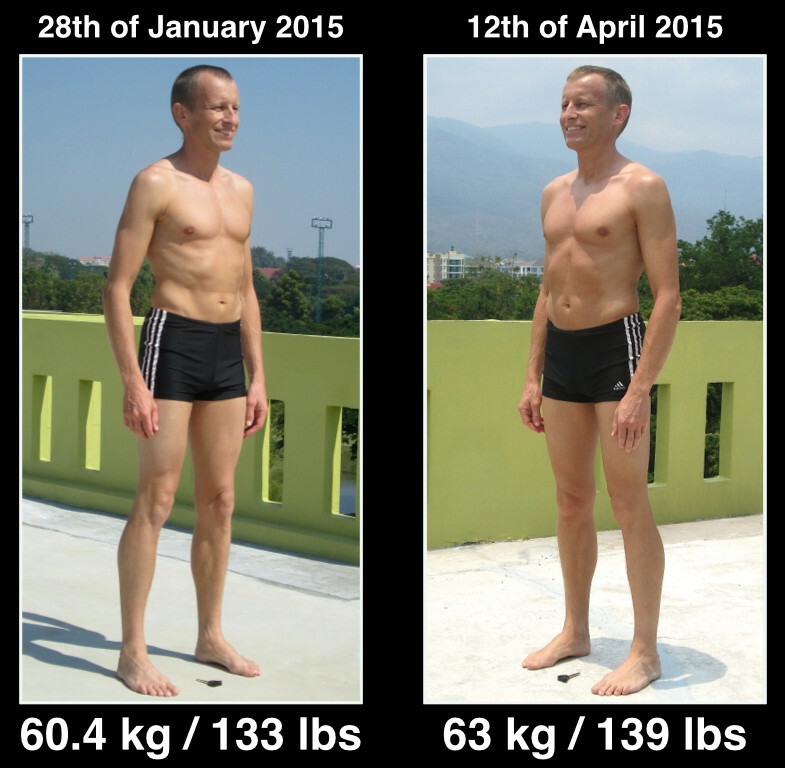 Taking into account, the similar appearance of my physique in 2013 and 2016 did make it seem plausible, that my Fat Mass (body fat) had remained relatively unchanged and the two kilogram weight gain was in fact mostly – Fat Free Mass (muscle, water, bone and organs). In this 5 minute video Dough McGuff explains the main principles behind High Intensity Training. The fundamental Body By Science workout protocol for HIT is referred to as the Big Five Workout. It incorporates five basic movements which are performed on exercise machines in order to take away the need for skill and thereby implementing a high level of safety – no weight can fall on you while doing these particular exercises. 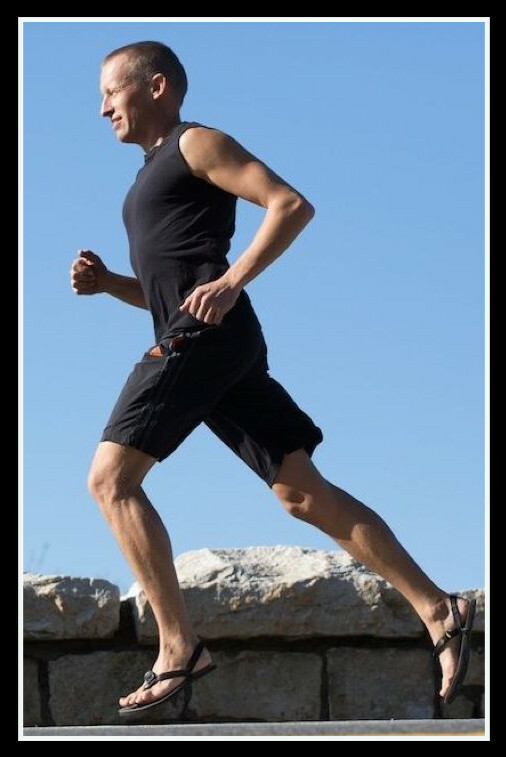 Having trained excessively and probably destructively, during my running days, I am now very aware of adhering to principle #4 and only doing the minimum amount of exercise required to stimulate a positive adaptation – namely maintaining my muscle mass and restricting body fat accumulation. My personal HIT workout – Big Four incorporates four of the Big Five exercises, which I perform in less than nine minute every seven to ten days. Measuring progress with this kind of training is done by what is termed Time Under Load (TUL), which is the amount of time your muscles are directly under the pressure of your chosen weight load. In other words, only time is counted and not the number of repetitions done on any given exercise. Striving to make sure that my TUL and /or the weight on each individual exercise in my BIG Four workout is consistently increasing (or at the very least maintained), will indicate my overall strength and muscle mass maintenance is on track. The TROM (Tiny Range Of Motion) Deadlift, is an exercise I use to test my near maximum strength, usually doing no more than one to five repetitions per set for five or six sets total. Executing this lift in a very small range of motion minimizes the risk of injury by only lifting in a posture where my whole body, especially my spinal column, is in the absolute strongest and safest position for a handling a heavy load. ….in terms of human metabolism, health and diseases of modern civilization this is where skeletal muscle effects really shine, the biggest component of metabolic syndrome is loss of insulin sensitivity…..and over time that loss of insulin sensitivity results in the disease states of modern diseases, type two diabetes, atherosclerosis, inflammation, all driven by this drop in insulin sensitivity…. As Doug McGuff points out in his presentations, when we gain a decent level of muscular strength through consistent but infrequent HIT, we seem to develop a natural desire for more spontaneous movement in general. The following exercises are part of my spontaneous movements which I perform on the ‘rest’ days in between my formal workouts (Big Four and The TROM Deadlift). I never pre plan doing these exercises, but simply allow my energy levels and time availability on the day to determine, whether it simply ends up being a good walk or a combination of several exercises – always keeping in mind that my objective is spontaneous rather than compelled activity. One of my favorite exercises for maintaining overall mobility is a Kumar – Carlos Push Up. I tend to do a set or two of 15 – 30 repetitions per set, it is a really good full body exercise which I find excellent to start the day &/or end the day, particularly if I have been sitting a lot. Performing a handstand, is a great way to make sure I maintain good coordination. 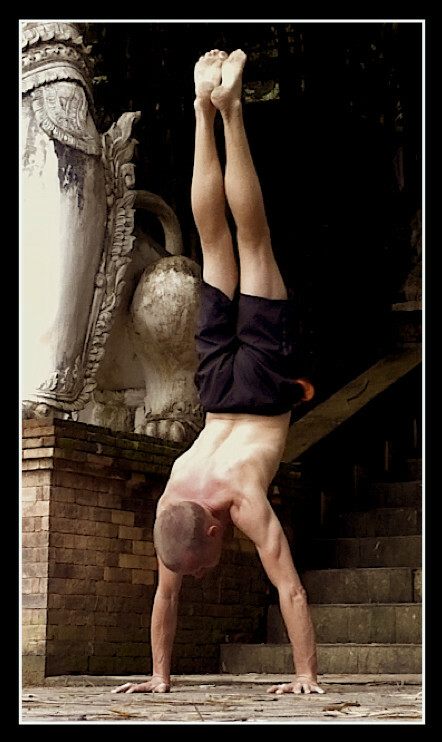 In fact, I believe both of these exercises are good for building overall coordination, because each one requires almost every muscle in the whole body to do work at the same time…..needless to say, I never perform my handstand to muscular failure 🙂 …but simply hold it for about 20 to 30 seconds at a time. HIT may only play a very small role in TIME and VOLUME, but the effect it has, when applied correctly, is in my opinion and personal experience – crucial for acquiring and maintaining a lean physique. After having my baseline Dexa Scan on the 14th of January 2016, I discovered the InBody 520 method which is less invasive, faster and much cheaper compared to a dexa scan. 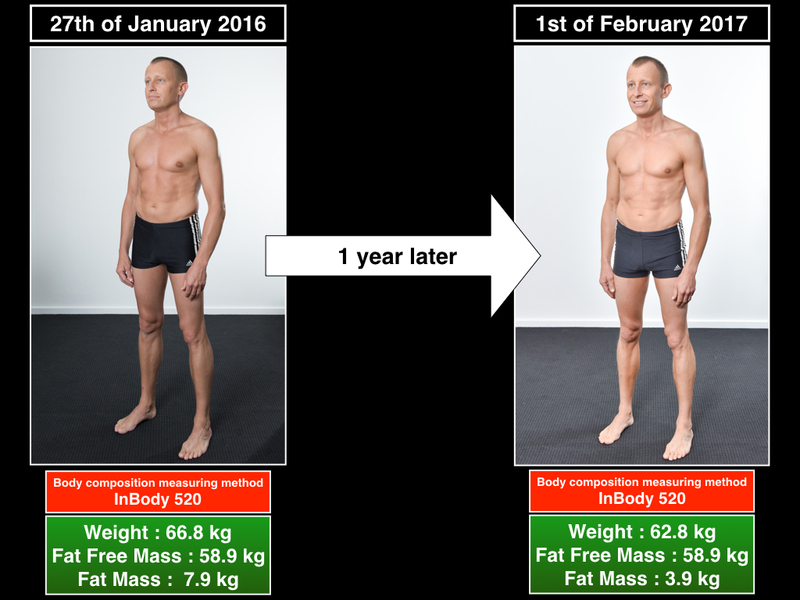 I therefore started using the Inbody method as my new body composition measurement method of choice, starting on the 27th of January 2016 as shown in the image below. I also commenced a documentation of my journey by having a professional photo shoot (trimphotography.net) done on the exact same day as my monthly InBody measurements. By doing a direct InBody to InBody comparison, performed under similar conditions (around 10am each time with no fluid or food intake three hours prior to testing) I am hoping the accuracy has been closer to a proper ‘apples to apples’ measurement. DEXA SCAN – a different story ? However, had I chosen to use my January 2016 Dexa Scan as my baseline measurement, it might just have told another story. By July 2016 the Dexa was showing a substantial loss in Fat Free Mass as well as Fat Mass. The reason I am hesitant in putting too much emphasis on comparing my Dexa Scan results above (other than vanity), is purely because I know they were done under two different circumstances. The first scan (14th of January) was done in the afternoon after completing an early morning HIT workout, having morning coffee and drinking water up until an hour prior to scanning. The second scan (25th of July) was done in the morning on a non training day and no fluid of any kind was consumed three hours beforehand. Since the beginning of attempting to track and quantify my body composition progress, I have realized just how important it is to control the variables in an experiment to obtain reliable results. In 2017, I will complete a Dexa Scan under similar conditions as my 25th of July 2016 scan. So far in this blog post, I have aimed to outline how I believe an excessive amount of physical activity resulted in a chronically exhausted physical state and storing of excess body fat in my own physique. I then explained how a very different approach to exercise, while high in intensity but low in volume, seems to have been extremely beneficial to my body composition. Over the past three years, I have also come to understand, that the true impact of food consumption, goes far beyond being merely being an energy source to fuel the body. In my previous blog posts Fasting, Ketosis & Fat Loss as well as Living In The Metabolic Zone, I share my personal experience regarding, what I believe are the benefits and consequences of having one’s body running on fat as it’s major fuel source. In all probability, adhering to a LCHF Ketogenic diet has been and continues to be at least ninety percent responsible for staying lean and getting even leaner after I quit long distance running. Just like the foundation of a building is the load bearing base, upon which the entire structure is built, so too is a specific metabolism within our body the foundation for allowing us to start releasing body fat to be used as an energy source and thereby become leaner. By eating a LCHF diet, we slowly start to change our metabolism into one which is very good a at metabolizing (converting into energy) fat. Eating more fat and less carbohydrates, gradually changes the body into a very efficient fat burning organism – exercise or not. Experiencing the change in my own physiology over the last four years since switching to a LCHF Ketogenic diet and reducing my exercise volume, has been profound, but like any new journey undertaken the learning which takes place along the way is always the most far-reaching. Emphasizing how important the role of exercise is and the extraordinary difference between being a destructive force versus a beneficial stimulus, is no doubt exciting, but unless HIT is applied into a body which is already primed by proper nutrition, it will not work nearly as well, if at all? Spearheading this way of eating is the Scandinavian country of Sweden, who in recent years seem to have a large proportion of it’s population adopting the LCHF dietary guidelines as a way of life. On Monday SBU, the Swedish Council on Health Technology Assessment, dropped a bombshell. After a two-year long inquiry, reviewing 16,000 studies, the report “Dietary Treatment for Obesity” upends the conventional dietary guidelines for obese or diabetic people. It started to seem like my transformation from FAT to LEAN, may be related to more than simply restoring my insulin sensitivity by persevering with a LCHF diet and changing my exercise approach, but also to how the 100 trillion organisms living in my gut might have changed in the last four years. 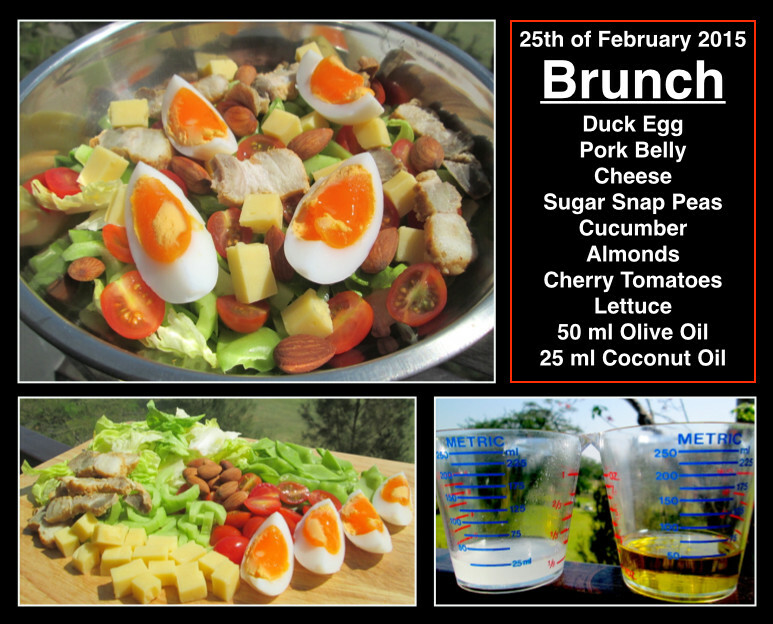 Me : Is a low carb high fat diet still the cornerstone of what you do ? Prebiotic : a non-digestible food ingredient that promotes the growth of beneficial microorganisms in the intestines. Since my own journey began almost four years ago, with lowering carbohydrates and a stronger emphasis on eating more fat, my natural tendency has gravitated towards consuming increasingly higher amounts of vegetables along with the fat. 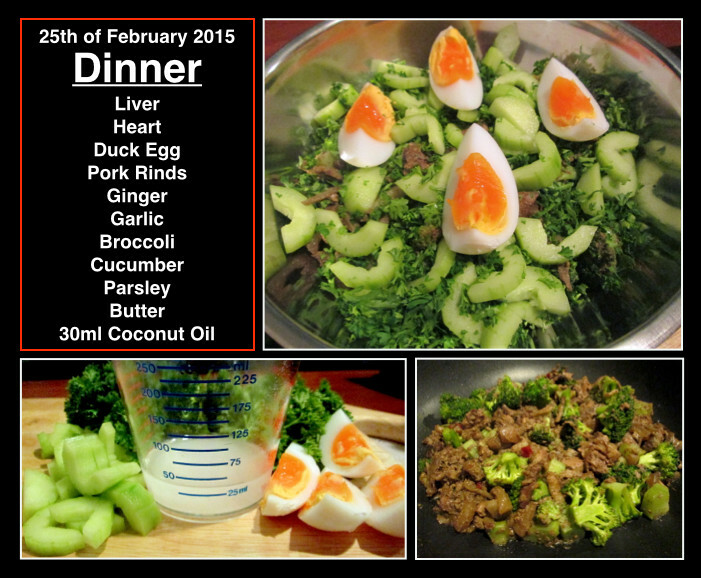 The following images illustrates the general composition of my meals these days. …being in mild ketosis does emulate to a significant degree what our paleolithic ancestors must have been like, but beyond the fact that you have looked very specifically at carbs versus fat, you have got to now look at nurturing your microbiome and that means the addition of adequate fermented foods teeming with good organisms, but more importantly nurturing the good gut bacteria with much higher levels of prebiotic fiber. While I have been busy doing my personal experimentation combining LCHF Ketogenic eating with HIT, a real scientist named Jacob Wilson has carried out proper scientific experiments in his laboratory at The Applied Science & Performance Institute. 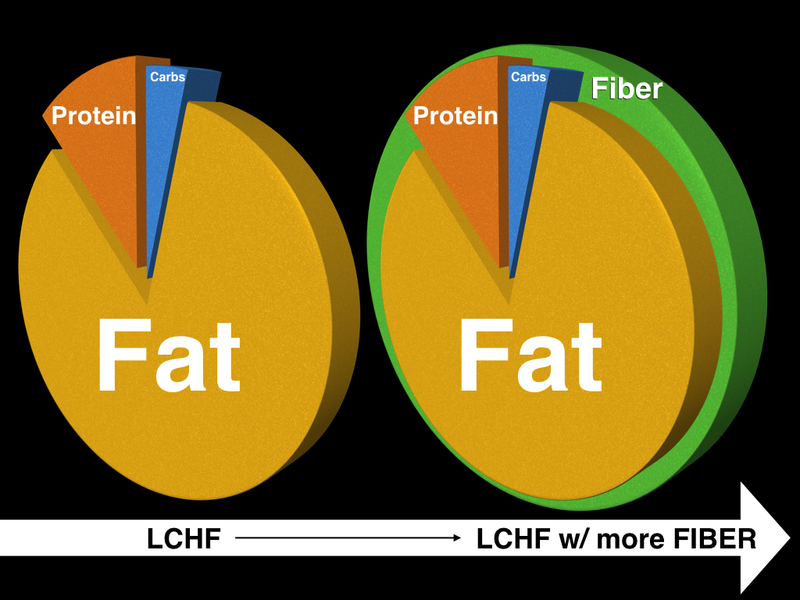 In his presentation Ketogenic Diets & Resistance Training, he covers the very latest science on why the restriction of carbohydrates in our diet while doing resistance training is so beneficial….he coincidentally concludes his talk by emphasizing the importance of FIBER. You can view Jacob Wilson’s presentation by signing up for a 30 day free membership trial on dietdoctor.com. After logging in, click Membership → Presentations → Low Carb USA 2016. Needless to say, if we want to live in a well functioning body, it requires us to invest a great deal of our effort and time to obtain an understanding of it’s essential requirements. The human body is simply a complex system, which we provide with proper nutrition, effective stimuli through exercise and enough good sleep – after which this complicated system will then convert all of these elements into a well functioning physique, simple! 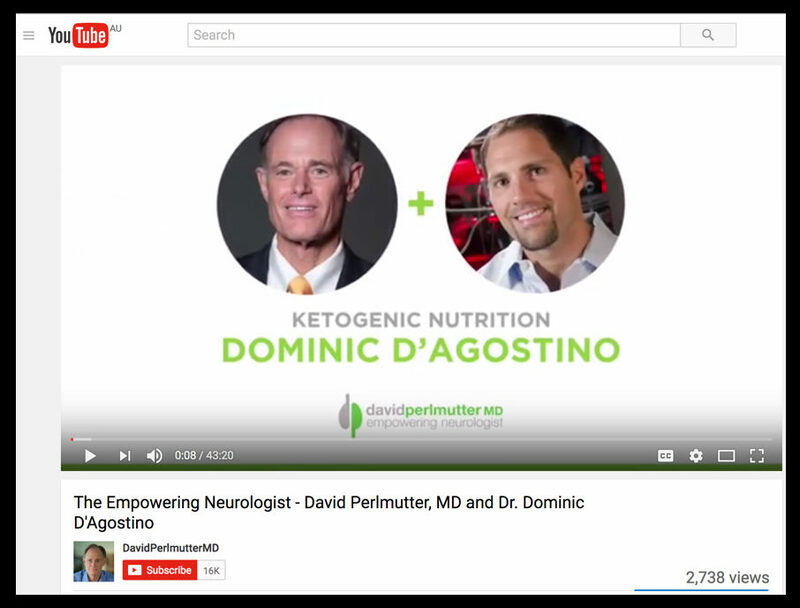 Since my journey began with the exploration of ketosis, I have become increasingly inspired by the work of Thomas Seyfried and Dominic D’Agostino. Their work is highly focused on the therapeutic value of using the ketogenic diet to maintain a bodily state of ketosis in people being treated for cancer. In 2013, Thomas Seyfried released his book Cancer As A Metabolic Disease. His main premise is that cells turn cancerous, due to their energy producing ability within being impaired, rather than the cause being defective, damaged or inherited cancer causing – genes. In several presentations (#1, #2, #3) he clearly explains how the nucleus of a cancer cell, (containing damaged genes) can be transplanted into a healthy cell, after which the cancer ceases to develop. This proves why defective genes – cannot be the driving force stimulating cancer growth and development. 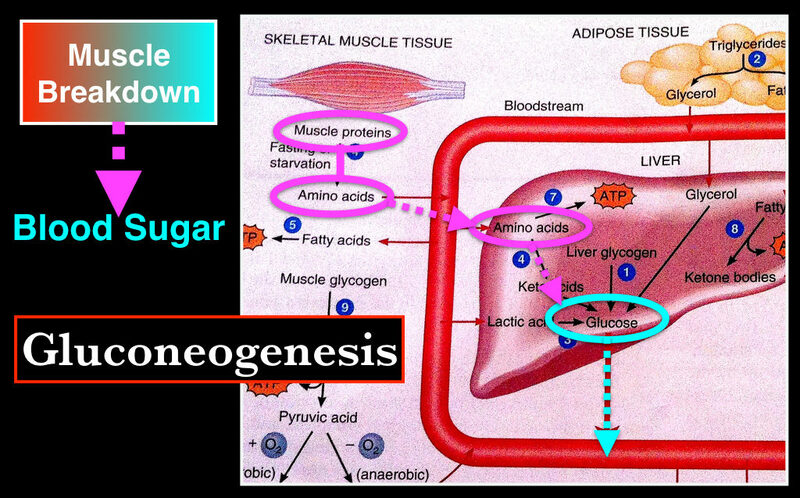 Cancer cells have a metabolic flaw, they cannot use fat & ketones for fuel – only blood sugar. By restricting calories, in particular carbohydrates, blood sugar drops lower whereby enormous stress is placed on cancer cells to obtain enough energy for their survival. Seyfried and D’Agostino are advocating a non toxic therapy, which exploits the inability of cancer cells to metabolize fat and ketones as an alternative fuel source when blood sugar becomes scarce. The Metabolic Zone is a term they use to describe the bodily state of high level ketosis, shown in their documented research, to effectively assist in weakening cancer cells. 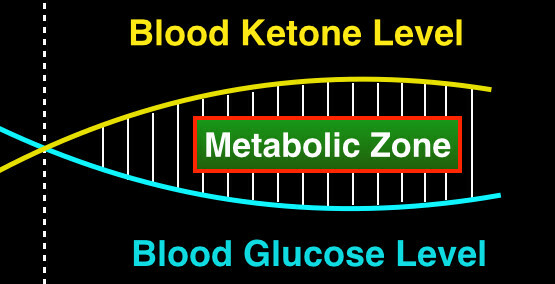 When ketones are above blood glucose/sugar levels …the body is inside the Metabolic Zone. In this presentation Dominic D’Agostino explains their non toxic therapeutic approach to treating cancer and why it is so crucial, that a person being treated with this strategy, to remain inside the metabolic zone. Fred Hatfield – one of the strongest men on the planet, was diagnosed with cancer and told by several doctors he only had three months to live. Fred used the ketogenic diet to overcome his cancer. His story, which featured on CBN News includes an interview with Dominic D’Agostino. In this interview, Travis Christofferson talks about meeting Thomas Seyfried and writing this brilliant book in 2014. Being a self proclaimed student, tester and experimenter of aiming to remain in ketosis 24/7, I find myself living in the Metabolic Zone for several hours on most days. 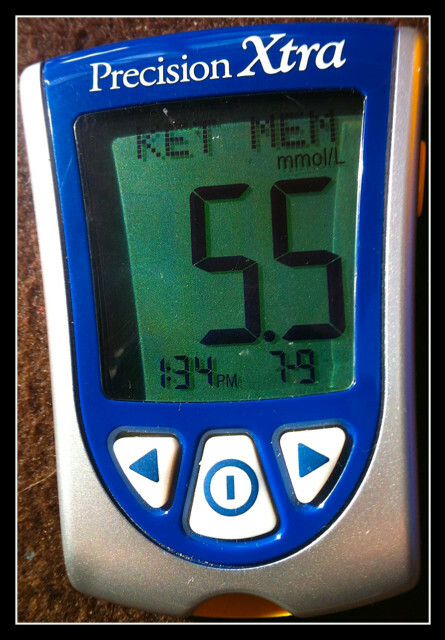 For 6 months, I have been rigorously testing my blood sugar and ketones, kept a detailed log of the results, paid close attention to the effect of exercise as well as the foods which seems most beneficial to raising ketones and keeping blood sugar low. 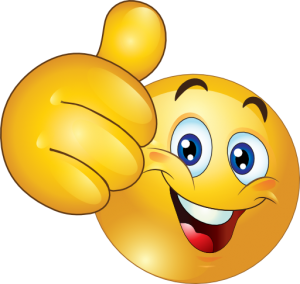 My continues experiment/study which involves daily adherence to close monitoring, requires a rock solid conviction that all of the money spent on blood sample test strips plus effort and time applied to the study of ketosis is all worth while…. ….I believe it is….and the best is yet to come. 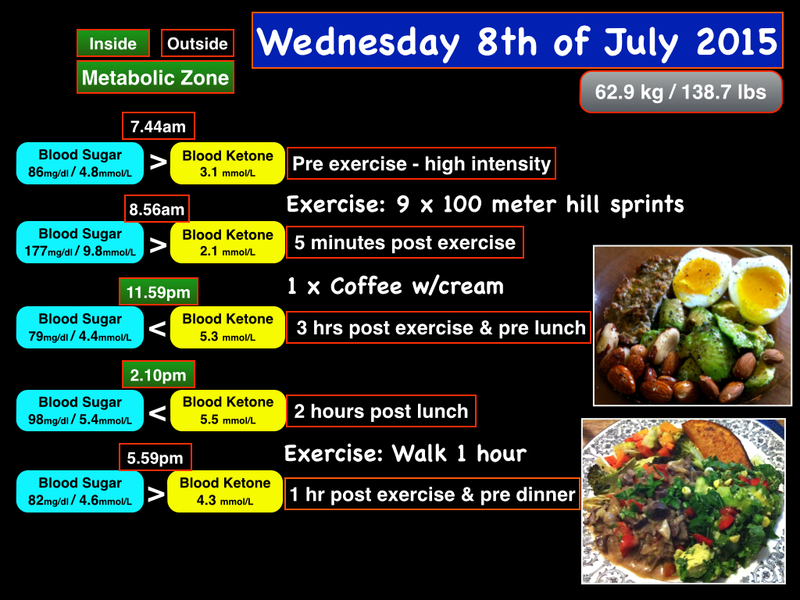 Living in the Metabolic Zone is something I more or less stumbled into. While studying the numbers of my daily blood tests, I noticed that on most days I would be inside the zone at some point. Being in the Metabolic Zone feels like…..well, being in the zone! Not only is this bodily state highly beneficial by aiding to weaken cancerous cells – it also amplifies one’s experience of daily living. 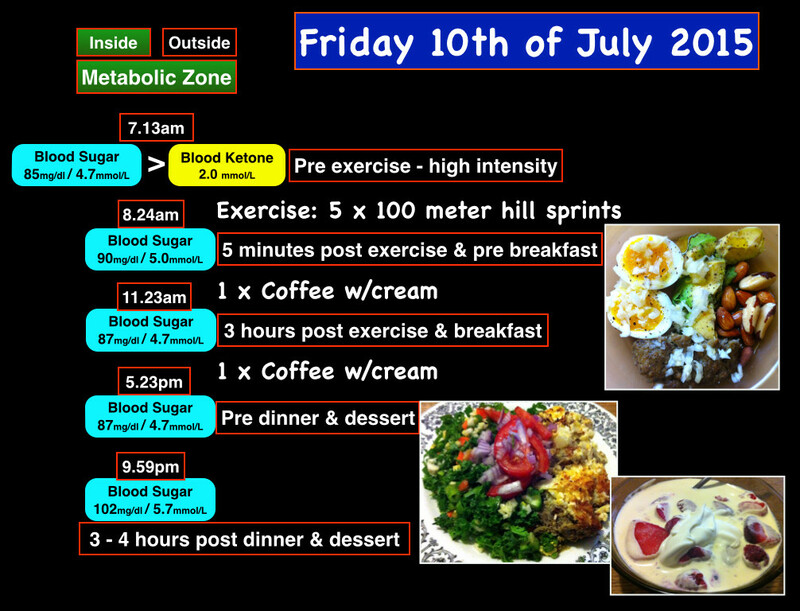 Below is my detailed account of three consecutive days living in the Metabolic Zone. I have been testing the effects of short intense workouts by running short hill sprints. The intensity of effort causes a rapid rise in blood sugar and drop in ketones, which only seems to be temporary. I firmly believe, that allowing my body time to calm down after intense exercise before eating, is a crucial factor to proper digestion. Since fasting in January, my weight has remained stable around 62 – 63 kg, every time it goes higher, I simply seem to lose my appetite. The combination of very light exercise followed by coffee is still a great combination for ketone production. From time to time I reach the same low blood sugar in a fully fed state as when I fast for several days. On this particular day it went down to 63mg/dl at 3.03pm. Blueberries, strawberries and raspberries with heavy cream, accompanied by some 85% dark chocolate, does not seem to raise blood sugar or lower ketones significantly. Using intense exercise as a strategy to burn up my already low glycogen stores and thereby lowering blood sugar, to then kick on a good rise in ketones a few hours later, seems to be working well. Eating too much food overall, even being mostly fat, seems to raise my blood sugar slightly and ketones can also come down, but it has never taken me completely out of ketosis. 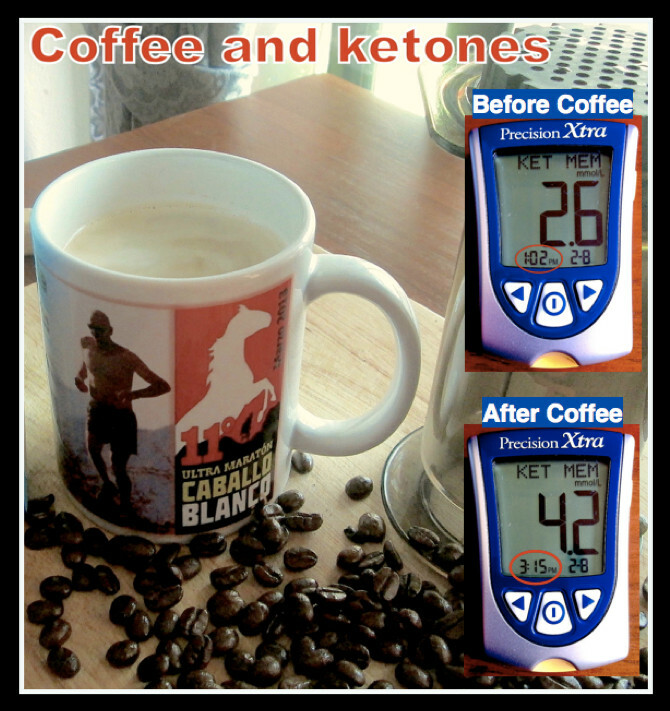 In The Daily Ketone Advantage I compare the feeling of being in a high state of ketosis to operating on ‘five espressos a day, without the shakes. This very obvious and strong effect, is most likely related to the description which Richard L. Veech and George F. Cahill, Jr attributes to ketones in their article Ketoacids? Good Medicine? A heightened mental state is apparent at lower levels of ketosis, but I find it much more prominent once I’m in the metabolic zone. 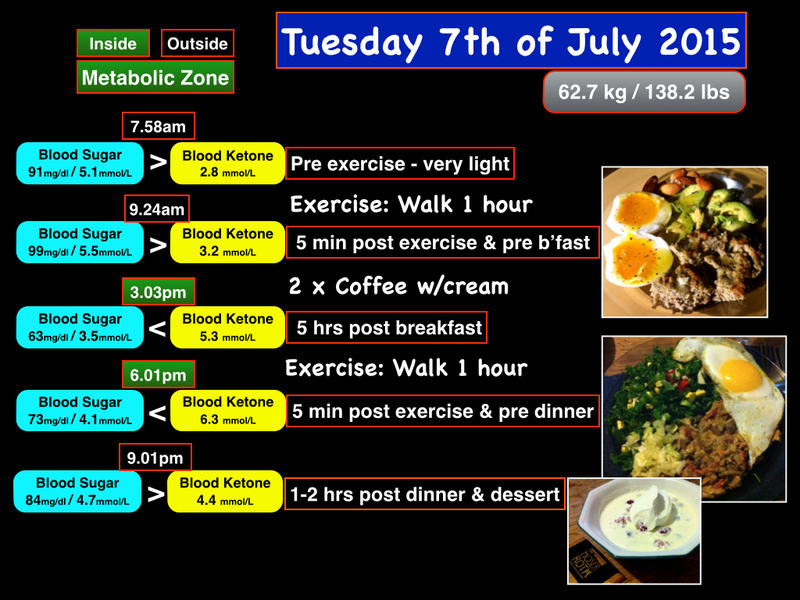 In the metabolic zone, one’s body is obviously metabolizing fat (dietary & body fat) into energy at a very high rate. It could be stated that fatty acids and ketones, have now become the predominant fuel sources for the body, instead of blood sugar. Because this high fat burning state is synonymous with limited/low glycogen stores, it seems very likely, that once no more food is left in the digestive system for conversion into energy, the suppression of hunger is due to the ease at which stored body fat is able to be metabolized. Never having been formally diagnosed or taken medication for depression, but being someone who still goes to a dark place in his mind where tremendous doubt in my own abilities to simply sustain oneself sets in, is something I’ve struggled with over the years. From exclusive personal observations in myself, I have found the ‘euphoric’ feeling of being in ketosis to help cultivate a sense of perspective, whenever life gets a bit daunting and gloomy. As with the perception of enhanced mental energy from ketosis, I find the ‘euphoric’ sensation most eminent when ketones get to a more elevated level, as when inside the metabolic zone. There is some speculation, which suggests, that by maintaining a relatively low blood sugar level together with the presence of ketones, contributes to greater insulin sensitivity or in some other way may help to better utilize and control blood sugar. 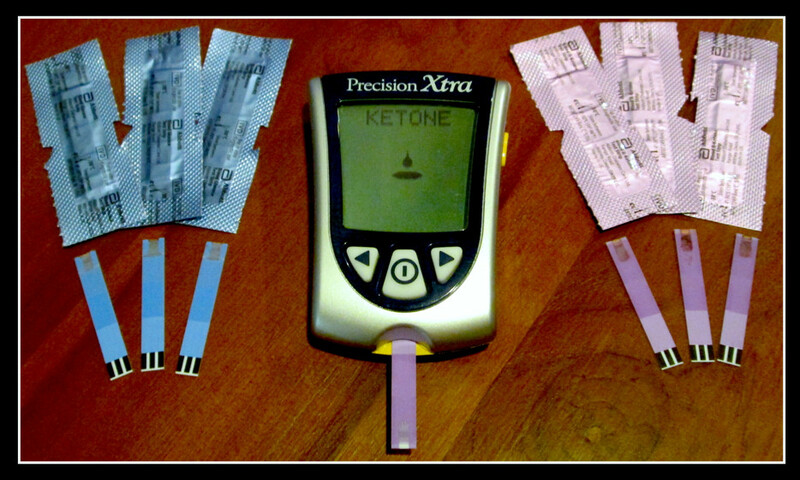 I decided to investigate how my body would handle a sudden high sugar load if I started out with a high ketone level – especially the effect it would have on my ability to maintain ketosis. 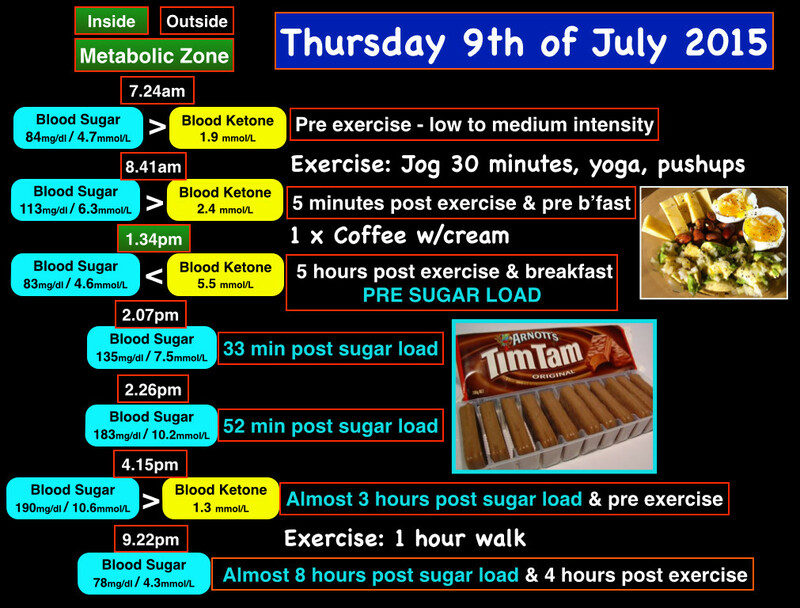 1.34pm – I was in the zone, with ketones at 5.5mmol/L, I started my sugar load by proceededing to eat a whole packet of Tim Tam’s. 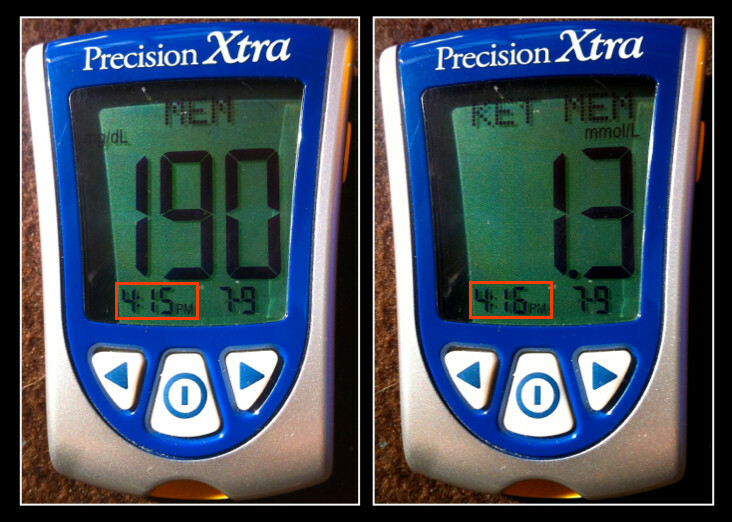 3 hours later my blood sugar was measuring 190mg/dl, but I still maintained a reasonable ketone level of 1.3 mm/L. Maintaining a state of ketosis parallel with very high blood sugar, suggests to me, that ketosis may be the preferred metabolic state for my body. Almost 8 hours after the first biscuit, my blood sugar had come back down, but I only had one ketone test strip left and decided to use it the following morning…. 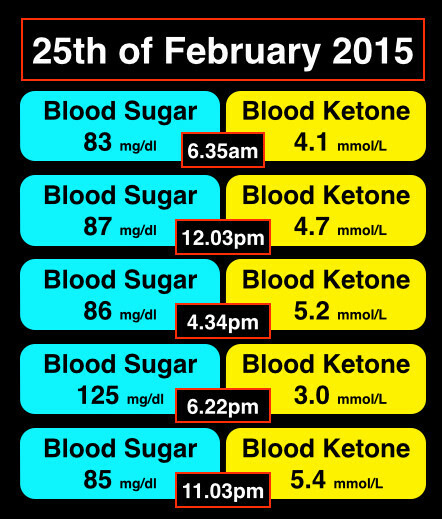 My first test at 7.13am showed blood sugar & ketone levels were back to normal. Being unable to test ketones, I could only see that my blood sugar followed it’s relatively normal pattern, indicating that my body had processed the big sugar load efficiently. (FACT) After a high intensity workout, my blood sugar (8.24am) remained stable, normally it would spike up. (THEORY)This may have been a direct result of having fuller glycogen (sugar) reserves in my muscles due to the high sugar load yesterday. A high intensity workout, normally causes a spike in my blood sugar. On the day after loading up on sugar, there was no significant blood sugar rise after my morning hill sprint session, indicating a big change in my body chemistry. As a consequence of “sugar loading” the day before, I now had access to much more “locally stored sugar” in my muscles, ready to fuel the sprint workout. Because my liver did not have to release it’s glycogen reserves into the blood stream during the sprint session, there was no big spike in my blood glucose level. Comparing this workout to previous sessions, my results was very similar, neither better or worse. The ability to successfully “fill up” my muscle glycogen stores and match my usual workout performance, implies a very flexible metabolism, which can adapt to a sudden change in fuel. Just as noticeable, is the observation that I performed no better after sugar loading, than I normally do on my regular very low carbohydrate diet – with limited/low muscle sugar stores. Arguably, the above statement is made on very thin ice, being a “one moment in time” case study – combined with the likely fact of my physiology, being favorably “set up” to metabolize fat rather than carbohydrates & sugar at present. 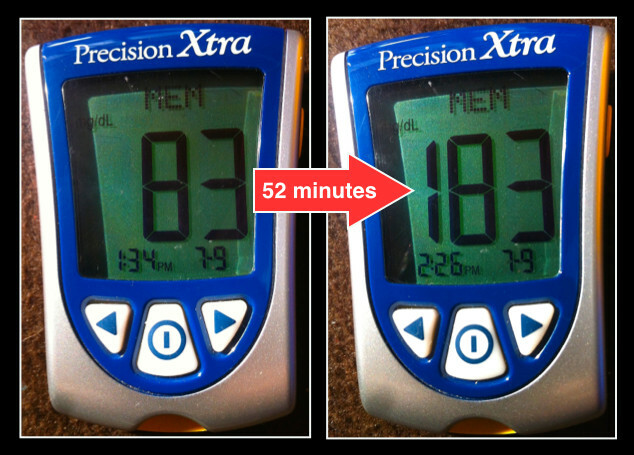 From the outset of eating chocolate biscuits my blood sugar rose rapidly (83mg/dl to 183mg/dl) over the next 52 minutes. I felt mostly fine, except for a little nausea, which could be expected, given the small time period I consumed the whole packet in. Judging by how energized I felt following my big sugar intake – with no subsequent crash highly suggests the majority of sugar was converted to energy very efficiently. 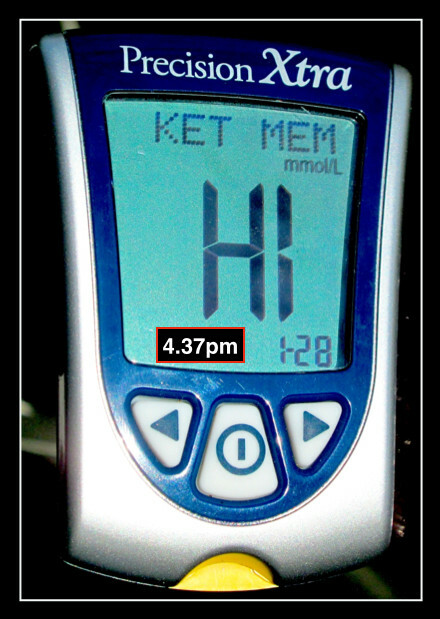 Being able to maintain ketosis (1.3mmol/L) in unison with high blood glucose (190mg/dl), was an intriging outcome and observation. This may have been possible, due to the fact, that I have remained in an almost unbroken and relatively high state of ketosis for at least six months. By ketones being so consistently present in the blood stream, my body may have evolved to prefer and depend on them as a major fuel source over time ? Seemingly, I handled a big sugar influx very well for someone who rarely consumes pure sugar and consistently eats a very low carbohydrate diet. Did my blood ketone level of 5.5 mmol/L, at the outset of the experiment, enhance my body’s ability to shuttle the enormous sugar load into my cells for energy use, thereby preventing an energy crash and a subsequent synthesis of body fat from the sugar consumed? work as a super fuel..